What do you mean, you don't like clowns? 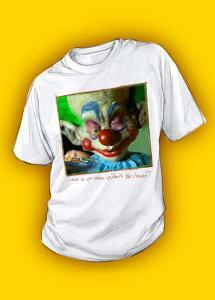 Know anybody who's got coulrophobia? Put them in an asylum with this sweet little garment. But please be aware: Killerplanes is not responsible for any freak-outs from exposure to this image. Comes in men's sizes Small through XXL (Steve's is an XXL- he's 6' 4" and 250, and it fits great even after washing) Our shirts are printed on high-quality 100% Cotton with the new Epson Photo T-Shirt printer, which does a STUNNING print job using inks that last through a LOT of washings. You'll still have your shirt long after most others have frayed and faded. Enjoy!